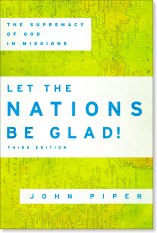 The following excerpt comes from “Twelve Appeals to Prosperity Preachers” found in the new edition of Let the Nations Be Glad. (John Piper)with a reference to our reading for today, Acts 14. Missing from most prosperity preaching is the fact that the New Testament emphasizes the necessity of suffering far more than it does the notion of material prosperity. Jesus said, “Remember the word that I said to you: ‘A servant is not greater than his master.’ If they persecuted me, they will also persecute you. If they kept my word, they will also keep yours” (John 15:20). Or again he said, “If they have called the master of the house Beelzebul, how much more will they malign those of his household” (Matthew 10:25). Paul reminded the new believers on his missionary journeys, “through many tribulations we must enter the kingdom of God” (Acts 14:22). And he told the believers in Rome that their sufferings were a necessary part of the path to eternal inheritance. Peter too said that suffering is the normal pathway to God’s eternal blessing. Suffering is the normal cost of godliness. “Indeed, all who desire to live a godly life in Christ Jesus will be persecuted” (2 Timothy 3:12). I am aware that these words on suffering move back and forth between a more general suffering as part of the fall (Romans 8:18-25) and specific suffering owing to human hostilities. But I will argue later in chapter 3 that when it comes to God’s purposes in our suffering there is no substantial difference. Prosperity preachers should include in their messages significant teaching about what Jesus and the apostles said about the necessity of suffering. It must come, Paul said (Acts 14:22), and we do young disciples a disservice not to tell them that early. Jesus even said it before conversion so that prospective believers would count the cost: “So therefore, any one of you who does not renounce all that he has cannot be my disciple” (Luke 14:33).